A superb double century from Samit Patel, his best score in first-class cricket, set up a big first innings lead of 232 for Nottinghamshire on the third day of this Championship match at the Brightside Ground, Bristol. Patel finished on 257 not out from 452 balls, with 23 fours and a six scored in over eight hours. It was the highest ever score by a Nottinghamshire batsman at Bristol. Gloucestershire finished on 30/1 at the close. Patel made the most of the flattest of surfaces to cash in against a Gloucestershire attack, which stuck to its task with commendable perseverance. His effort was all the more praiseworthy in view of the difficulty all batters have had in this match scoring quick runs. But there has been even less help for the bowlers. Even Mike Procter, a legend in these parts for his exploits with bat and ball for Gloucestershire in the 1970s – here to promote his new book and raise money for his charitable foundation – would have struggled to make much progress with the ball in this match. Stuart Broad will have been pleased that the extent of his duties involved some sprint exercises in the tea interval, while his father joined Procter and former colleagues at the Gloucestershire old players’ day. Nottinghamshire resumed this morning on their overnight 221/3 from 82 overs, with Samit Patel (78) and night watchman Luke Fletcher (0) the not out batsmen. Gloucestershire took the new ball from the start and Craig Miles soon accounted for Fletcher, caught at second slip. Patel reached his 25th first- class century with a lovely square cut to the boundary from Miles. With eight fours, this 224 ball century wasn’t one of his quickest but own a slow pitch it was a creditable effort that caused wicketkeeper Gareth Roderick to look back, with regret, on dropping him on 52 yesterday, an error he repeated today. Michael Lumb joined Patel, the pair adding 54 for the fifth wicket until Lumb was lbw to Chris Liddle for 23. At lunch Nottinghamshire were 313/5 from 108 overs with Patel on 131 and Riki Wessels 15. Wessels showed intent to push the score along before lunch, but any feeling that he would be instrumental in helping to bat the visitors into a winning position disappeared when, soon after lunch, he played a nothing shot to Jack Taylor and was out lbw. West countryman Chris Read, in his final season for Nottinghamshire, twenty years after he begun his career at Gloucestershire, joined Patel who was now playing with more fluency than he had showed throughout his innings. He passed his 150 as Read reached 16000 first- class runs. As Nottinghamshire neared the 400 mark Patel, batting with supreme authority, exceeded his previous Championship best, 176 – also against Gloucestershire in 2007. Read played some excellent attacking shots before he became Kieran Noema-Barnett’s first victim, chopping on for 40 at 408 for 7. Patel carried on in a calm, untroubled fashion. 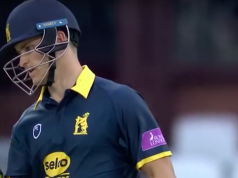 He cover drove Noema-Barnett to reach his double hundred, scored from 381 balls with 19 fours, a milestone reached with an agile jump and air punch of which Christian Ronaldo would have been proud. Nottinghamshire reached tea at 439/7 from 144 overs with Patel on 203 and Brett Hutton on 11. Hutton was out in the first over after tea, caught behind swishing at Liddle for 11. That was the last of the Gloucestershire successes as Patel and Luke Wood, who looked a very high class number ten, saw the visitors to their declaration total. Wood ended on 38 not out. The Nottinghamshire total was achieved from 166 overs. The wickets were shared between the bowlers, all of whom returned presentable figures, only Liddle’s 2/89 costing more than four an over. Gloucestershire faced the unenviable task of batting out ten overs to the close. When Cameron Bancroft was lbw in Fletcher’s first over the locals feared the worst, but Chris Dent (18) and Will Tavaré (7) saw out the day without further mishaps. With batting seemingly so comfortable on this pitch, and only 19 wickets having fallen in three complete days, a draw seems much the most likely result. 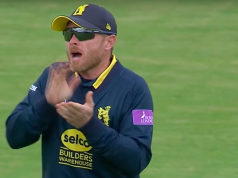 But Gloucestershire will be haunted, and Nottinghamshire encouraged, by the innings victory enjoyed against the hosts by the Trent Bridge side two weeks ago.